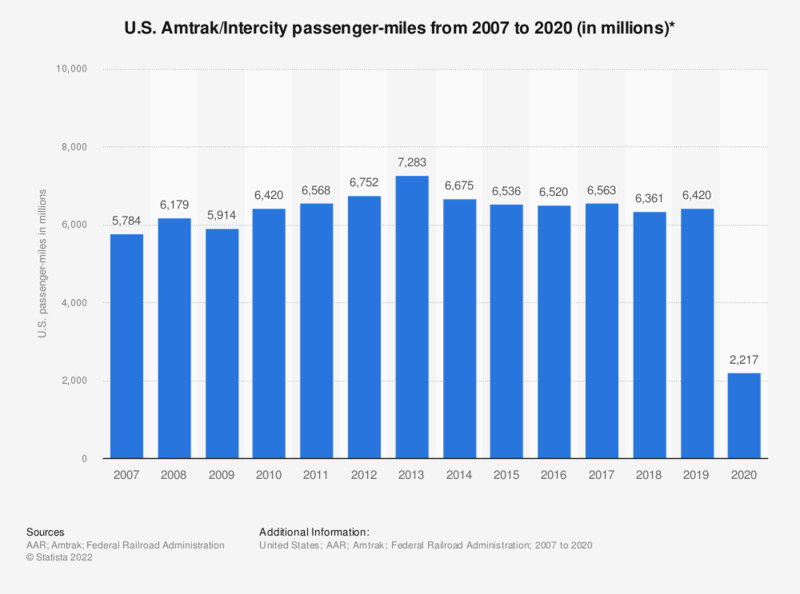 This graph shows Amtrak/Intercity passenger-miles traveled in the United States from 2007 to 2018. In 2018, passengers traveled around 6.36 billion miles by Intercity/Amtrak. Amtrak, also known as the National Railroad Passenger Corporation, is a publicly funded service. Rail passenger-miles represent the movement of 1 passenger for 1 mile. * Does not include contract commuter passengers. To retrieve the data, select Individual Railroads as reporting level, Amtrak (National Railroad Passenger Corporation)[ATK] as Railroad, the start year and end year and click Generate Report.